The artwork was commissioned for use during the 1936 Olympics in Berlin, but the beer company decided against exporting its brew to Nazi Germany. A screenshot of one of the Guinness ads. 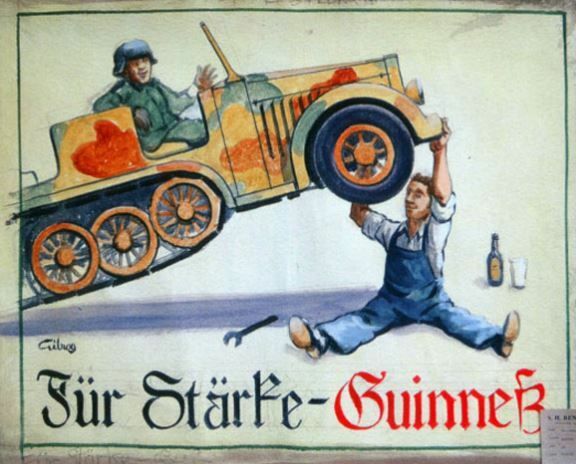 Nazi-era Guinness ads portraying German soldiers enjoying a pint are currently making the rounds on Twitter. It turns out that Guinness’s ad agency at the time, SH Benson, commissioned the artwork for use during the 1936 Olympics, which were held in Nazi Berlin. But the company scrapped its plans to start exporting to Germany and the ad campaign never went ahead. So, all we're left with are some bizarrely innocuous ads of smiling soldiers and the earliest known use of the Guinness toucan in advertising – escorting a German zeppelin!